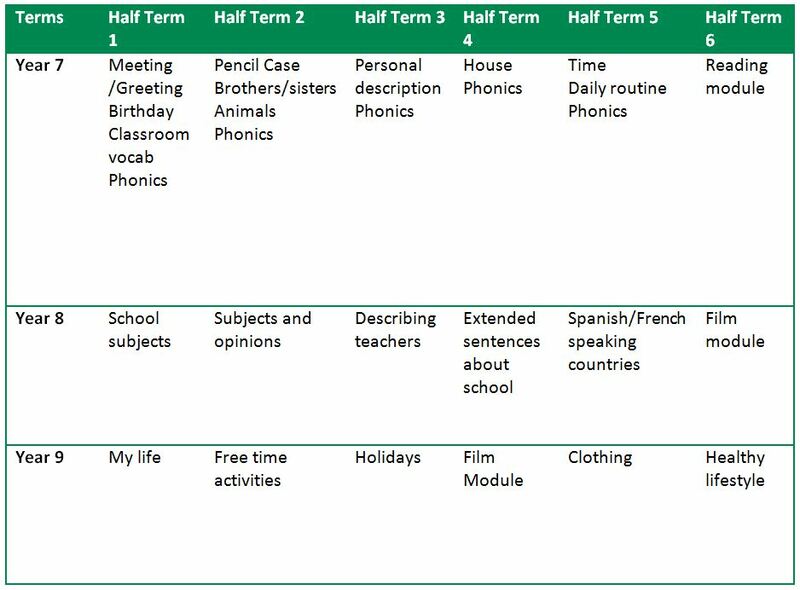 Either Spanish or French is taught for two lessons per week in Year 7, 8 and 9. Teachers incorporate a variety of software and resources to deliver varied, fun and interactive lessons covering a broad selection of subjects including greetings, numbers and the alphabet to daily routines, hobbies, media, and past/present/future sentence structure. Teachers also use Spanish or French to deliver their lessons whenever possible enabling students to gain confidence in understanding, following and using the target language to communicate. GCSE Spanish and French are taught for three lessons per week. Each classroom is equipped with an interactive whiteboard and internet access. Teachers incorporate a variety of software and resources to deliver varied, fun and interactive lessons. Teachers also use Spanish or French to deliver their lessons whenever possible enabling students to gain confidence in understanding, following and communicating in the target language. Each lesson, students should expect to engage in the four skills of language learning – listening, speaking, reading and writing. Grammar, games, songs and challenges form an integral part of the experience for KS4 students.